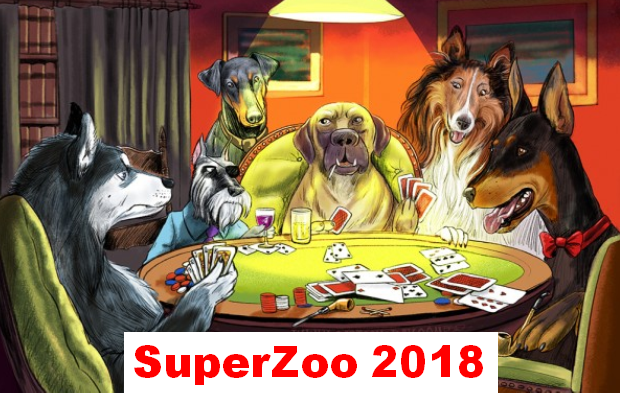 SUPERZOO 2018 – It’s a great Opportunity and a Sure Winner! SuperZoo 2018 is only a month away. It is most definitely a great “Opportunity” for attendees and exhibitors and the “surest bet” in Vegas. Like Global Pet Expo, SuperZoo is a “must do” if you want to be a player in the U.S. Pet Market. There are differences between the two shows. After all, GPE started the U.S. Pet Industry with the first trade show 60 years ago. It is still the largest annual show and has a huge international following with over 200 exhibitors from outside the U.S. On the other hand, SuperZoo traces its roots to a regional trade show for independent pet shops. It too has come a long way since those early days. Although Independents are still a major focus of the show, it has expanded both in size and its reach. With nearly 1200 exhibitors, a special section devoted to the fast growing grooming segment and over 100 international exhibitors, it too has become a “destination” for manufacturers, distributors and key players from all retail channels. SuperZoo’s growth has not come without challenges. The latest started last year. In an effort to increase their impact on attendees, Exhibitors increased their booth size by 20%. Although the staff was able to acquire more floor space, it was not enough, so the exhibitor count was reduced by over 100. With another large trade group competing for space in the same time frame at the convention center, there was only one logical choice – move to a different date. Because of the impending Holiday season, a later date was not an option so they chose late June, 3 months after GPE. This caused a little “hand wringing” by some exhibitors and a few decided to pass. However, these were rare exceptions, not the rule. The exhibitor count is again approaching 1200, but with the larger booth size. Exhibitors will occupy 285,000 square feet, up 23,000 sq ft (9%) from 2017. Plus, there is also room for a 23,000 sq ft New Product Showcase and over 7,000 sq ft for new sections showcasing Tech Advancements and Made in the USA products – two “hot” societal trends. Let’s take a closer look. We’ll start with some overview trends then move to the special floor sections. You first notice that the count in Special Floor sections fell 6.6% while the overall exhibitor count increased by 8.7%. Smaller booths drove the increase. 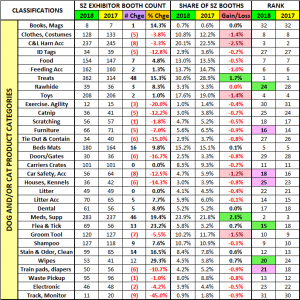 97 more booths were 200 sq ft or less. 76 of these were 10×10 or smaller. Since I began tracking SuperZoo in 2014, special sections have accounted for nearly 50% of exhibitors, peaking at 52% in 2016. This year’s 38% is even 6 percentage points below last year, when the show ran out of floor space. Every special section but 1st timers has fewer exhibitors than last year. However, remember that over 400 companies weren’t at SuperZoo 2017 so the 74 doesn’t reflect the true count of new exhibitors. The Natural Section is still large as this trend continues to be strong in the marketplace. The Grooming segment also continues to be important as this segment is growing and becoming even more competitive. Rodeo drive is down 35% from its peak in 2016, perhaps reflecting the increased emphasis on function over fashion. Ultimately, the show sets the size of the sections based upon exhibitor feedback. However, we may be reaching a point where exhibitors are less likely to embrace a limited categorization of their appeal. Now let’s look at the Exhibitors by type, including animal. Almost all segments gained exhibitors but remember, to maintain your share you need an increase of at least 8.7%. The most significant decline is in Fish – down to a 5.5% share. This is even more significant when you consider that in 2015 the share of exhibitors offering fish or aquatic products was 8.6%. That’s a 36.0% drop in only 3 years. There was a big lift in Equine products which was driven by a big increase in the number of Horse Supplements. Gifts/Gen Mdse/Uncategorized had a strong increase but is still down from their peak of 139 exhibitors in 2016. We also need to take note of Business Services – up 9 (7.8%) from 2017, but up 79 (+176%) from 2014. As always, Dogs and Cats are the royalty but the Cat share of exhibitors has grown from 44% in 2014. Let’s take a closer look at the “royalty”. Here are the top 10 Dog and/or Cat Categories at SuperZoo 2018. You can see that it’s not all “rosy”. 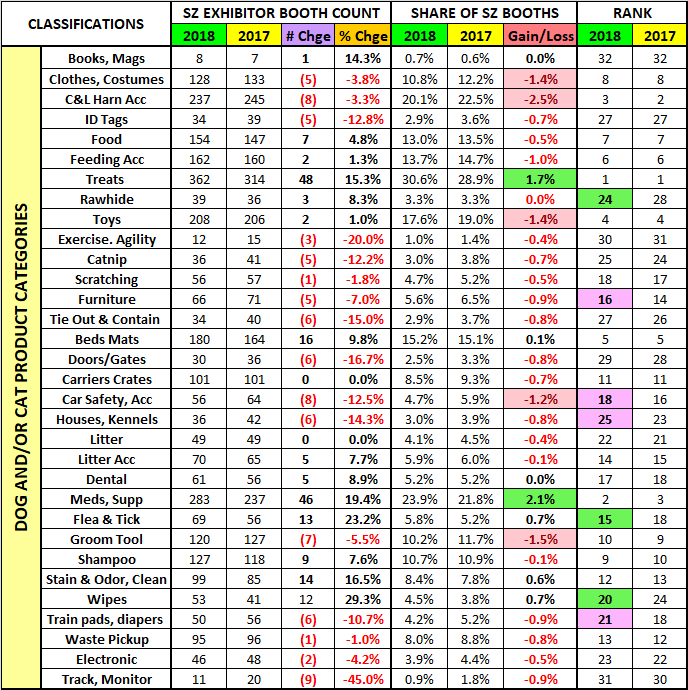 Three categories actually have fewer exhibitors and only three kept pace or exceeded the 8.7% increase in exhibitors. The 2018 Top 10 is the same as 2017 but two gained in rank and 2 fell. The drops in Collars & Leads and Clothes are perhaps understandable as the industry moves more towards function. However, the decrease in Grooming Tools in conjunction with the increase in shampoos is a bit of a puzzle. Both categories are still strongly represented and this may be the result of competitive pressure in the grooming area. Toys are losing share but surprisingly beds are gaining ground and floor space. The big news is the seemingly unstoppable momentum of Treats and Meds & Supplements. In many cases their success is tied together as Supplements are often produced in Treat form. They now rank #1 & #2 in terms of exhibitor count, which is up 57% for Treats and 73% for Meds & Supplements from 2014. Amazing! SuperZoo is growing in exhibitors and size. There are products and services available to fill virtually every need or want of the attendees. It is also staying in tune with what is happening in the overall consumer market which is illustrated by the new Tech and Made in the USA product showcases. 994 exhibitors (84%) focus on Dog/Cat. Let’s take a closer look. There are 95 more Exhibitors at SuperZoo. Those offering Dog and/or Cat products increased by 86. However, the increase is not “across the board”. When you look at the 5 Dog/Cat Categories making big gains, you can see a common thread – the health and wellness of our companion animals. This fits right in with the ongoing trend in Pet Food to more nutritionally focused recipes. SuperZoo certainly showcases what is “happening” in the Pet Industry and offers a great opportunity for attendees and exhibitors to make a mutually beneficial connection. Once again, it’s the surest bet in Las Vegas! TAKE A LOOK. I HOPE TO SEE YOU IN VEGAS!